This activity works best in a dark space. Targets for the game can simply be objects in the room, or you can create a target that you move around the room. Draw a series of concentric circles, like a dart board target, with markers on a large piece of chart paper and post it in an area suitable for aiming at. If you first tried the Let Your Light Shine activity from this curriculum, ask your students what observations they made when they played with light. What happened when they shone their light at a mirror? If you have the list of rules from that activity, bring it out and read the rules to your students. Tell them that you are going to challenge them to use everything they learned about light in those experiments by playing a game where they have to hit a target across the room with their beams of light. Try to hit the target with your light! This is a team-based target game, using flashlights to try and hit the targets. 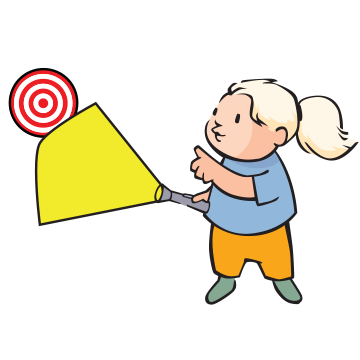 You can either use the chart paper target that you created (see “Preparation”), or you can choose objects around the room to use as targets for the game (a poster, an ‘X’ you make on the wall with tape, a light fixture on the ceiling, a bookcase, etc.). For each round, you should have each team use the same target, and you can move the chart paper target around the room for other rounds, or choose a new object in the room as the target for each round. Divide the group into teams of two or three and give each team a flashlight and a mirror. Have teams spread out across one side of the room in a line, and invite them to spend 10 minutes or so practicing bouncing the light from their flashlight off of their mirror and noticing where it goes. Tell them that they will play a game where they will be challenged to hit a target with their light bounced off of their mirror. Each team will take turns trying to hit the target. One team member should be in charge of the flashlight, and another one or two in charge of setting up and holding the mirror. Teams should position their mirrors with the flashlights off. Teams cannot turn on their flashlights until it is their turn to try and hit the target. When the teacher says it is a team’s turn, that team should hold their mirror in the spot they think it needs to be in order to hit the target, hold the flashlight where they think it needs to be, and then turn the flashlight on. Wherever the light hits on the wall as soon as a team turns on their flashlight is where that team gets credit for hitting. If a team hits a part of the target, they get a point (or points if there are multiple zones on the target). Each team gets three tries at a target per round. In between tries, teams can move their mirror, their flashlight, or both. Teams should stay where they are in the room. Add up the scores and see who came out ahead! After the first round, when each team has had three tries at hitting the first target, bring the whole group together. Did it get easier to figure out how to point their flashlight and where to face their mirror? Do any teams have tips for how to figure out where the spot of light will land before they turn on their flashlight? If the first round was a real challenge, give teams some more time to practice before playing again. Try the game a few more times. For each new round, choose a new target in the room or move the target you have created and play again. Try smaller targets for more of a challenge, larger targets if teams are struggling. For an especially challenging new twist, have teams try to hit the target bouncing the light off of two mirrors. Light travels in straight lines. Light that bounces off one surface onto another is reflected. Mirrors reflect most of the light that hits them. If we know the direction for which the light came, we can predict the direction of the reflected light. Understanding reflection is a valuable principal in some engineering design or can be used, as in this activity, to play a game.